Update: The price dropped every LOWER on Amazon today! We found a hot deal on Protein Powder on Amazon! 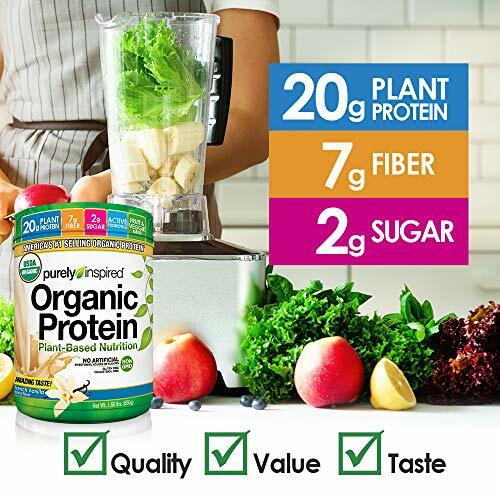 Hurry and get the Purely Inspired Organic Protein Powder, 100% Plant Based Healthy Protein, French Vanilla,1.5 pounds today for only $29.99 as low as $5.65 from Amazon when you clip the 30% off coupon & choose Subscribe & Save with at least 5 subscriptions in one month. Save big! This product has many variations at different prices! Quickly see them all here. Check out all of the recent Amazon deals here! Want it sooner? Choose one-time purchase, clip the coupon & pay $7.20. Amazon Prime members get FREE 2-day shipping!! If you are not a Prime member, get FREE shipping when you purchase $25 or more of eligible items across any product category. Buy the Purely Inspired Organic Protein Powder, 100% Plant Based Healthy Protein, French Vanilla,1.5 pounds from Amazon. Next article25 Awesome Sweet Potato Recipes!